Vomiting. Illustration of the mechanism that causes vomiting in the human body. An impulse from the front of the brain has stimulated the vomiting centre (green) in the brainstem. This sends nerve impulses to the stomach, diaphragm and abdominal wall. 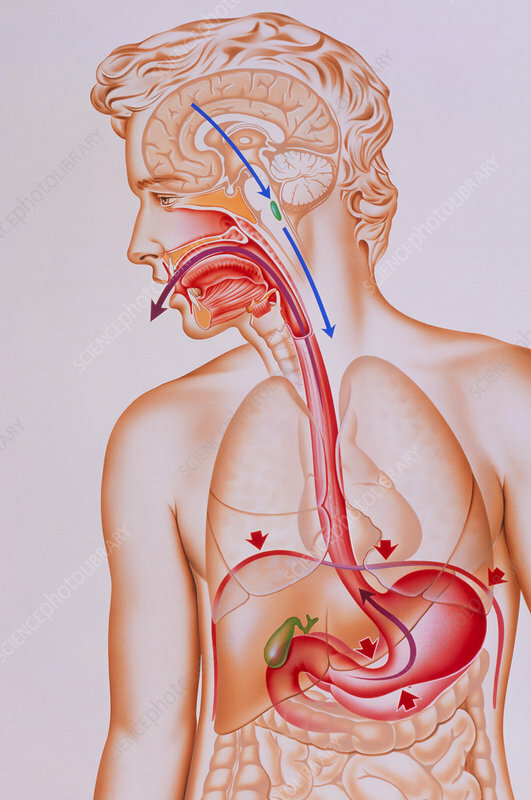 In response, the diaphragm (red line above stomach) pushes down, the abdominal wall presses inwards, and the bottom of the stomach constricts. The stomach contents are expelled up through the oesophagus and out of the mouth in a jet. Vomiting can be triggered by the digestive system, balance organs, and certain compounds in the bloodstream, such as alcohol. It can also occur as a purely psychological reaction of disgust.